Two billion hours of Netflix video were streamed in the last 3 months of 2011. Are you among those watching streaming video on your TV or mobile devices? Ever noticed how the picture can become blocky and even freeze up? It may not be Netflix or your Internet service provider's fault. It could be that you, your spouse and your kids all have devices on your home network vying for access to the Internet. Western Digital's My Net™ Family of Dual-Band Routers with Exclusive FasTrack™ Technology prioritizes audio and video on your home network, ensuring your video always looks good. And when paired with a WD Live TV for accessing video streaming apps and a My Book Live for watching home movies, you'll have a complete streaming video solution. How do wireless networks handle smartphones, tablets, TVs and gaming consoles all vying for Internet access? What are the best ways to get streaming video to your flat panel TV? What are the best places to find free movies? How do you watch your pay TV service on your mobile devices? We’ll discuss these things and more as we chat about all things streaming video on Tuesday, June 19th at 1 p.m. EST/10 a.m. PST. WD Live TV ($129): Stream the latest movies, trending videos, hit shows and your favorite music. Plus, play your media collection in virtually any file format from drives, computers and more. My Book Live ($199): Access your files at home or away with your Mac, PC, smartphone and iPad. Stream videos, music, and photos to your WD Live TV, connected TV, game console or media player. 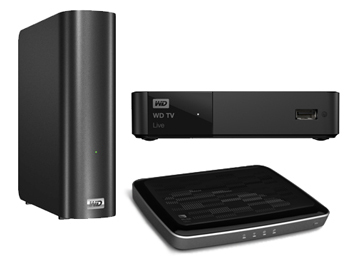 We're giving away this Western Digital video streaming bundle (MSRP: $507) to five lucky #TechTea participants, courtesy of Western Digital! RSVP by commenting below for a chance to win! Enter your name and Twitter handle. To be eligible to win you must RSVP and participate in the event using #techtea #wdmynet . We will randomly select one (5) winners from the entries. No purchase is necessary to win. Void where prohibited. U.S. residents only. Click here for the full rules. @slstaffo RSVPing see you there! I will be there! I know we will learn alot of useful information. Sounds like a cool party!